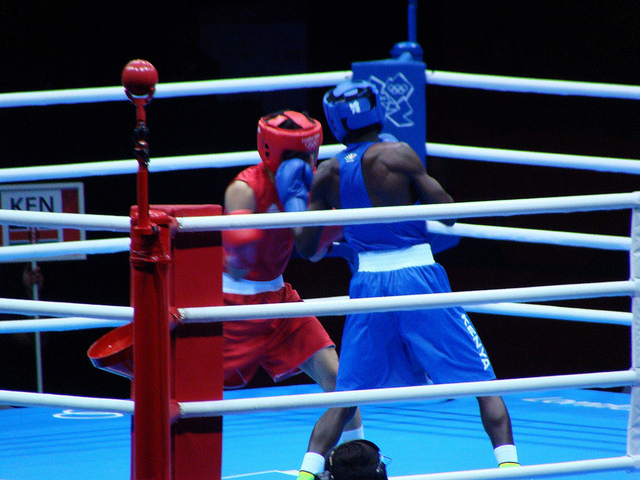 Every boxing match is unique - therefore there are no special tricks for controlling the flow of every fight. Learning to control a fight or solve problems you encounter in the ring comes down to experience. The more time you spend in the ring - sparring and fighting - the more comfortable you'll get being in that combat situation. The better you will be able to pick up the subtle cues of combat and respond appropriately. Show up in the best shape possible. Boxing conditioning will be an asset or a liability. It's one variable you have total control over so there's no excuse to show up without the strength, speed or stamina to perform at 100% effort for the entire match. Stay loose and relaxed. If you're tense - your reaction time increases and you burn energy for no reason. Fancy may work - boxing fundamentals do work. Your game plan builds on a solid foundation. Act invincible - even if you know you're not. Never show weakness. Like a shark in a feeding frenzy - if you show signs of fear, hurt, or indecision you can expect your opponent to feed on it. You'll effectively give them superpowers. On the other hand - rest easy knowing that your opponent is as or more hurt, tired, or afraid as you are. Your forward hand is the safest way to start a combination - use it. Move. Standing still and being a static target gives your opponent too much time to size you up and decide how to attack. Keep presenting something new but don't jump around unnecessarily and waste energy when out of striking distance. Protect yourself at all times - hands high - get lazy and get knocked out. Be aware of distancing. If your opponent is in striking range - you are in striking range. Strike first. Clinch and smother any chance of counter attack when you miss or are in a bad position. Exit the clinch correctly or wait for ref to break. Keep it random. Don't establish patterns by doing things the same way. Go down the same road twice and expect to get blown up. Once you cross the striking zone and are inside your opponent's guard - stay there and keep punching. Every opponent is tough. Remember that it doesn't take a lot of power, skill, or speed to knock someone out. Don't over reach. Maintain a solid base so you are never off balance. Off balance and over reaching leaves you open for counter attack. If you punch - PUNCH! Snap it - don't push it. Connect - if you're punching for the sake of punching you're wasting energy. Find the opening - then attack otherwise move and feint until you get the opening. Your target is behind where you are hitting. Make sure your fist ends up there. Use forward momentum and torque from the hips when you hit to hit hard. There is no power in a punch while moving backwards. Protect against ambushes. If your opponent wants you to do something - make sure you do something else. If you stop punching - you stop winning. Never quit trying to land the one that will end it. Stay where it's safe - in close, head at waist level, hands high. Be extra careful when crossing into the striking zone or leaving it - those are the times when you are most vulnerable. If your opponent is set and about to punch - MOVE! Watch for what your opponent does immediately before he leads.. It's like being able to tell the future. Note peculiarities and patterns to exploit whenever possible. If you throw a left jab - expect a right cross - do something about it. Straight punches get to targets faster than bent arm punches. A two handed attack should be done from inside the guard - otherwise you're wide open for counters. Start your attack from outside the guard. Rear hand punches and short hooks are counters. Use them as leads and expect to get hit.